Every day, food and agriculture brands face a new wave of increased pressure from consumers, digital influencers, regulators and other stakeholders to drive change. It wasn’t always this way: farmers produced crops and livestock, sent them through various channels to store shelves and restaurants, and consumers purchased what was available. They didn’t have much influence. Today, through new communication channels, consumers and influencers have a direct voice and are using it to play a larger role to impact how the foods system operates. With so much at stake, how will you adapt and grow trust in your brand? We live these challenges alongside our clients every day. We’re food and agriculture experts. We understand food and agriculture at a deep level, and know that building brand trust and transparency will serve to improve the food system as a whole. Our team of seasoned, passionate pros leverage decades of food and ag experience and our extensive network of food system influencers to drive real change. Our peer reviewed and published trust model – combined with our values-based strategy, connections and communication solutions – help you engage through relevant and meaningful communication. The end result is an improved conversation, and greater trust between our clients and their customers, stakeholders and consumers. 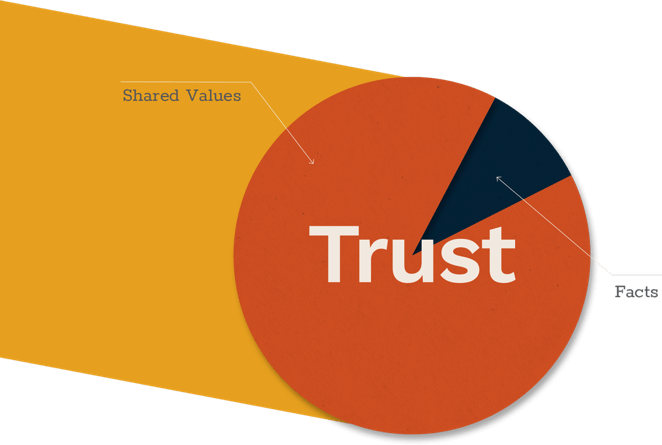 While facts are important, research shows that shared values are 3 to 5 times more important in building trust. Commonalities move people to experience a greater connection with your brand. That’s why we focus on identifying and communicating the values you share with your stakeholders to build trust in your products, processes, people and brands. This is our industry. We’re in it with you. As farmers and city kids turned food and ag pros, we put our love for this industry to work, every day. We focus on effective engagement that knocks down barriers, builds bridges, and creates brand champions. The value to our clients is priceless, and the value to the food system is immeasurable.